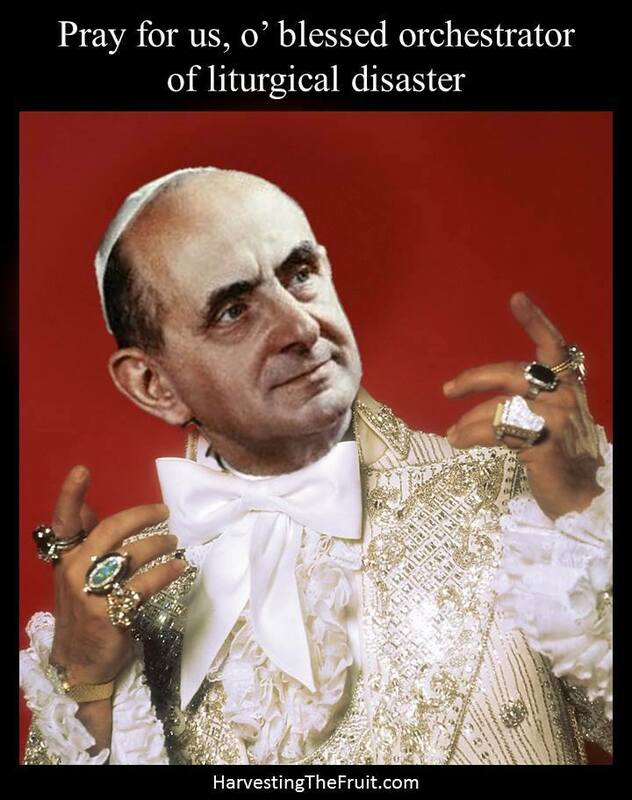 With the ersatz “canonization” of Pope Paul the Pathetic fast approaching, Catholic News Service – the wholly-owned propaganda arm of the USCCB – is ratcheting up efforts to sell the idea to members of the undernourished rank and file. Yesterday, they published an article about how Paul VI “moved and inspired a young man discerning the priesthood.” That young man is none other than Pierantonio Tremolada, the current Bishop of Brescia, about whom we will have more to say in a moment. “He offers us an example with his esteem, his love for the world,” Tremolada said. Ah, yes… love for the world. If nothing else, let us gratefully acknowledge the candor with which conciliar churchmen speak. 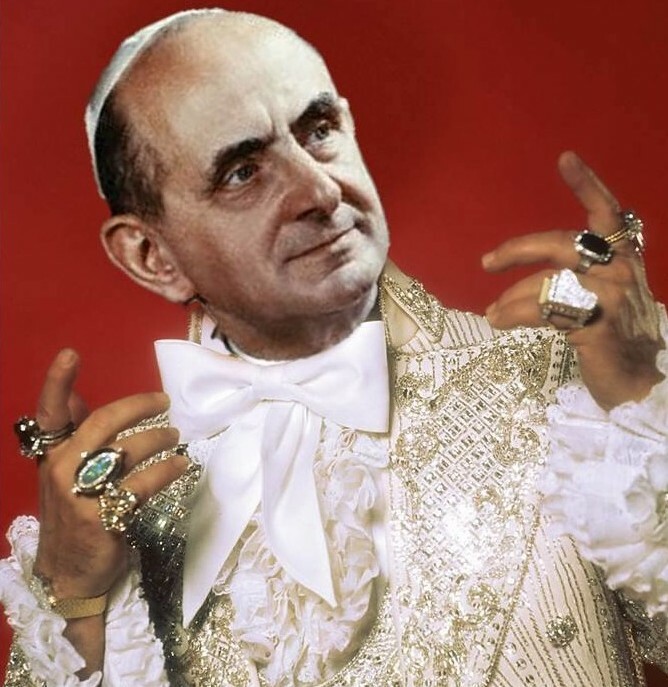 Throughout the article, Paul VI is portrayed by Tremolada as an inspiration to youth. The saint-to-be is a particularly suited example for young people because he exemplified a youthful optimism, hope, curiosity and openness to the world and the future … wanting to know and dialogue with the world … This desire to contribute and speak sincerely with others is very much in line with young people. His hands? I’m not certain, but something tells me that the aforementioned psychiatrist might have a thing or two to say about this one. In any event, it is perhaps understandable that “young people” would factor so heavily in this article given the fact that Montini will receive the Conciliar Lifetime Achievement Award for Service to the Revolution as the LGBT… I mean… Youth Synod is in full swing. Even so, readers may find it stunning that CNS would choose to feature Bishop Tremolada in this article given that the current homo-clerical cover-up crisis is also in full swing. According to a report on the Bishop Accountability website, in 2011, a priest by the name of Mauro Galli admitted to his bishop that he shared his bed with a 15-year-old boy during a sleepover, but he denied that any molestation had taken place. In 2012, in light of the ensuing scandal, Galli was transferred to another diocese where he was given a position working in the field of, guess what? You got it, youth ministry! When the boy’s parents discovered that Galli was again working with children, they contacted then-Archbishop Angelo Scola, who arranged for the parents to meet with his aides, Father Pierantonio Tremolada, a supervisor of new priests, and Bishop Delpini. The parents recorded both conversations. In their August 2012 meeting with Tremolada, they asked what the priests in Legnano had been told about Galli. Tremolada said he had told the dean about ‘the thing of the bed’ but instructed him not to tell anyone else, including the other priests. “It would be incorrect!” Tremolada said, according to court testimony. On September 20, 2018, the Court of Milan found the child molesting homo-cleric Mauro Galli guilty of abusing his 15 year old “sleep-over” guest, who attempted suicide in 2014, and sentenced him to six years and four months in prison. This is the man about whom Pierantonio Tremolada said “It would be incorrect” to warn anyone concerning his homo-deviant appetite for teenaged boys. With all of this in mind, it would seem that Catholic News Service chose well in featuring Tremolada in their article. I, for one, have no difficulty whatsoever believing that young Pierantonio felt inspired to enter the seminary by none other than Paul VI, a man, he told CNS, that he “would like to emulate” as bishop.